Compiled and Written by: Shirley West and Harvey E. West, Jr.
Graeagle (pronounced Gray Eagle) and named after Gray Eagle Creek, began as a mill town, being part of a 13,000 acre timber tract acquisition by Arthur Davies from the Sierra Iron Company back in 1916. This vast parcel stretched from Blairsden to Calpine in present day Sierra County. Davies also owned a sawmill operation in Sardine Valley (located off of Hwy. 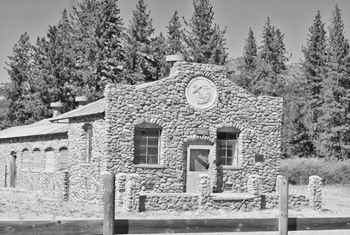 89 near Dog Valley and Stampede Reservoir) as well as a sawmill in Delleker, just outside of present day Portola. Arthur Davies built a new sawmill in June of 1916 behind the current Graeagle grocery store (The Graeagle Store). Initially the new plant was cutting about 50,000 board feet of mostly pine lumber per day, but in 1917 a fire destroyed the mill. It was quickly rebuilt and about 13-14 million feet of timber was cut that year. The new mill needed housing for its employees at this new endeavor, so Davies had his company houses in the Sardine Valley transported via the Boca-Loyalton Railroad to Graeagle. The homes were sawn in half so that they would fit on the B&L flatcars, then moved by rail to Beckwourth, where they were transferred to NCO trains and carried to Clio. From this point, a combination of horses, wagons and vehicles moved the assorted buildings to Graeagle. To this day, one can still see visible signs of the joining on the red houses that adorn the main street. Other dwellings also came from the Clairville and Delleker areas by placing giant logs under each to act as a skid and then they were methodically moved by either horse teams or Mack trucks to Graeagle. With the assorted buildings and other improvements, including a large dairy and a company store, the community started to take form, centering around the mill. By 1918 a post office was established. It was at this point that the California Fruit Exchange of Sacramento came into the picture and offered Davies $1 million for his holdings, which by the time the deal closed had risen to $1.25 million for the Davies mill complex. The California Fruit Exchange then utilized the lumber facilities to make a multitude of fruit boxes that were needed within the fruit industry in the Sacramento valley. Those fruit-filled boxes were shipped to markets back east via the WPRR. A millpond was created, a box factory built, molding and planing mills erected as well as drying kilns. More employee housing was added. A huge boiler was constructed next to the mill for generating steam power for sawmill. Around 1920, family homes appeared along the main street. A steam line that ran across the highway serviced the large red houses on the hill (across from the current grocery store). A hardware store, a butcher shop and a slaughterhouse were built nearby. One of the many buildings still standing in the area is the old “dairy”, a stone building, built in the 1930’s, that is situated near the Blairsden bridge on the FeatherRiver, just a short walk or bike ride from downtown Graeagle. Fresh milk was delivered daily to the family homes and the cookhouse, which is the present day Graeagle Restaurant. This building also housed a pool table, barbershop, an upstairs beauty parlor and an adjoining ice cream parlor. A dance hall (behind the Graeagle Restaurant) and movie theater completed the offerings, along with a filling station, at the same location of the present day Chevron station. The old schoolhouse, now located at the intersection of Hwy. 89 and A-13, was known as the “Mann School”. Grades 1-8 were taught in the two room school, with high school being located over in Portola. And with over half of the town’s population being single, each and every “school marm” was courted regularly, got married and evidently they didn’t stay on to teach for very long. Today the schoolhouse building is home to several retail establishments. In 1922, a fire partially destroyed the store, clubhouse and theater. Story goes that the store fire happened as a result of a cover up for shortages in the payroll by one of the time keepers. He was found out and did serve several years in jail. But by mid-summer of 1923, the Clubhouse was rebuilt and reopened. A large dedication ball was thrown with nearly 500 people attending, supposedly the largest to that date gathering of guests and visitors in the county. Other structures and buildings in town included a potato shed dug into the hill across from the store, a tall white house across from the dairy that was both a stagecoach stop and hotel, three large three story bunk houses along Gray Eagle Creek, a blacksmith shop and the present day maintenance shop. The maintenance shop was built to accommodate locomotives, with a railway running in one door and out the other. One of the bunk houses burned to the ground in the 60’s and the other was dismantled by Tom Maher of Gold Lake and is now the Gold Lake Store. The third was torn down and moved to Frenchman Lake (present day) for the men logging in the area. By this time, there were about 600 workers in the woods and at the mill, including the families. Men worked ten hour shifts, six to seven days a week, waking up at 6 a.m. with the sound of the Fruit Exchange whistle and reported to work at 7 a.m. For 35 years, the Graeagle Lumber Company employees were awakened by this whistle. The women shared long hours too, keeping domestic duties such as cooking on woodstoves, washing the family clothes on washboards and other manual chores of the day. By the 30’s and 40’s, some roads began to be paved, and gas or propane began replacing wood stoves in local homes. Electric stoves appeared in the early 1940’s and radios began keeping the populace abreast on outside issues and for entertainment. The Graeagle Fire Department sponsored many social events, including a Christmas Gala. The community hall was festively decorated and many volunteers assisted with the event. Slot machines were leased from Harry Jones in Portola and these provided for most of the profits for these events. There were orchestras out of Reno, door prizes donated by local merchants and a large supper was served at midnight. Besides the Christmas Gala, the Graeagle Fire Department also managed monthly Saturday night dances that became known as the Fireman’s Ball. Picnics and family dinners were additional community events, along with an occasional silent movie. Another active group of the day was the Sportsmen’s Association. They were the group that provided for the boxing arena and prizefights that were held twice monthly, giving locals summer entertainment. The arena was located at the present day ball park on Iroquois Trail in Graeagle. The boxing arena seated 800 people and was complete with lights. The Sportsmen’s Association was also responsible for the local baseball team. Teams from all over Northern California, even from as far away as Salt Lake City, came to Graeagle to play the national pastime. Baseball and boxing were the favorite summer activities and in September the California Fruit Exchange sent three or four carloads of grapes to Graeagle. It was such a big event that when it arrived, the mill whistle would blow and everyone gathered to receive a share of the grapes. From there, the locals made wine from the company supplied grapes. An additional bonus that the California Fruit Exchange did was provide every family with a free turkey at Christmas time and free turkey dinners were provided for the bachelors at Thanksgiving and at Christmas time. Each child was also given an orange, a sack of nuts and a toy for the holidays. Work was hard in those days, but life was good. The town was provided for and fishing and hunting was abundant. Relatively speaking the wages earned per day by a mill worker could pay the monthly rent in only one day. A married couple paid $8.50/month for their company home and that included water, electricity and garbage. By the late 1940’s, it was increase to $12.50/month, but by that time the hourly wage was about $1.50. Single men paid $1.25 a day for both room and board. This including having his bed made every day and clean sheets twice a week. With the mines shutting down and with World War II, activities slowed down for a short period. After the war, the mill continued but in 1951 the millpond was washed out and in 1954 the cookhouse shut down for good because it was losing too much money. Another economic reality was that the availability of marketable logs was disappearing nearby. And, cardboard boxes started replacing wooden boxes for the transport of fruit and vegetables nationwide. The Graeagle Lumber Mill shut down on the last Saturday in October of 1956. To commemorate this event, the mill whistle blew for five solid minutes signifying that the last log had gone through the band mill. With huge stacks of cut lumber remaining, the planing mill continued until May of 1957 when lumber activity in the Mohawk Valley shut down. The mills equipment was auctioned off as two hundred buyers from all over the western states came in late May of 1957 to buy the sawmill, box factory and planing mill equipment. It only took one day for it to be sold. Amazingly, within two weeks of the auction only two or three families remained in town. In essence, the town was deserted, all the other houses became vacant and abandoned. In February 1958, Harvey West Sr., offered California Fruit Exchange $450,000 for the remaining property, which was 13,482 acres of timberland, town, farm and meadowland. West, a large timber operator based in Placerville, CA, now owned a town comprising 42 houses, a clubhouse, store, butcher shop, dairy, warehouse and school for about $43/acre. Included in the semi-ghost town were the water and hydro power plant rights. This once bustling community now was desolate of people. But, the West’s had plans for the area and a Master Plan was developed. With paved highways spreading throughout the west, the accessibility factor once a hindrance was fast becoming an asset. The early 1960’s saw great advancement in highways, freeways and ownership by average people of automobiles. So, it was determined that Harvey West, Jr. along with his wife Shirley and their (then) two children moved to Graeagle permanently. Graeagle Land and Water Company was established, and the master plan and dream began from there. Today the privately held GLW Company is managed and maintained by Harvey West, Jr.’s son, Dan West. Dan’s wife, Leah West is an active Realtor® in the original real estate office since 1990. Water was obtained from Long Lake high in the Lakes Basin. The area surrounding Graeagle was surveyed and with a slow-growth philosophy, homesite parcels of roughly one-third acre in size were created. Sales were held to only 40 lots per year and these generally sold for between $1995 to $3500 per lot. The championship 18-hole Graeagle Meadows Golf Course was constructed between 1962 and 1970. Tennis courts were added in 1974. A bit later, in 1974, townhouses and cluster homes were built: the “Graeagle Meadows Condominium” project and 150 units are occupied and enjoyed today. Today, the West family maintain the beautiful town of Graeagle in much the same manner of yesteryear, providing services for the community and continuing to develop, cultivate and support the local businesses and townspeople. The downtown commercial core of Graeagle has been preserved with its historic charm of an earlier period of Plumas County history. Graeagle Land & Water Company: “Celebrating 50 years of building Friends, Families…. and Community”! "“Terry helped us find a great house for us. We only had a couple of days a month available to find our home. We made two offers which didn’t... continued"